The Committee in Defense of Democracy (Komitet Obrony Demokracji, or KOD) appeared to start suddenly out of thin air. It is now the biggest mass mobilization of Polish citizens since the days of Solidarity twenty-five years ago. Although on the one hand this was clearly a response to the electoral victory in October 2015, of the right-wing Law & Justice party, on the other it is also a result of the spontaneous idea of a certain internet surfer. The idea for KOD first appeared on a website called Studio Opinion, a somewhat old-fashioned site edited by respected journalists of the pre-Internet era who had mostly been part of the moderate wing of Solidarity and had contributed to the peaceful dismantling of Communist power in 1989. Someone had posted the suggestion that in view of the winning party’s breaking of laws in its very first hours, it was time for a citizens’ movement that would defend democratic standards. The writer already had a name for it: the Committee in Defense of Democracy, or KOD, nicely echoing the acronym KOR, the Committee in Defense of the Workers, a key forerunner of Solidarity. Law & Justice is the first party since 1989 to rule alone without coalition partners. After almost a decade of defeats, they rolled up their sleeves and undertook to bring order to the state in their own way and at a pace that resembled firefighters who were igniting a fire instead of dousing it. The new government is composed of people who had long been known for their radicalism and notoriety, yet Law & Justice had reassured the public repeatedly during the electoral campaign that these would not be considered for ministerial positions. But instead of fulfilling their electoral promises, such as lowering the retirement age and providing free medicine for older retirees, the regime immediately tightened control of police, secret services, and media, and recently expanded its surveillance powers vis-à-vis citizens, in effect freeing those services from any democratic control. This all took place during hurried, largely nighttime, less visible marathons in which the parliamentary majority repeatedly short-cut democratic procedures and ignored the requirement to consult with society. One of their first, and to their own surprise most troublesome, battlefronts was their subordination of the Constitutional Tribunal and the freeze they put on its ability to function. In Poland, as in Germany for example, the Constitutional Tribunal had been established precisely to make sure that legislative acts are in accordance with the Constitution. And then there was the new President, Andrzej Duda, who as the candidate of Law & Justice had won the presidential election by a spectacular margin half a year earlier. He ignored decisions concerning the composition of the Constitutional Tribunal that had been made by the prior Parliament, and waited until the new Parliament could quickly vote to invalidate them. Then in December, he swore in five new judges elected by the new majority, even though at least three of the judges elected earlier — and in full accordance with the law — had already been waiting for months to be sworn in. Duda himself, a doctor of law, dismissed the opinion of all legal experts and swore in three of “his own”, and then eventually two others. At this point all civic institutions from the Ombudsman through the National Judiciary Council to the Office of the Prosecutor General protested, one after the other. Even the Jagiellonian University, where the sitting president had received his doctoral degree in law, gave a negative assessment of these feverishly hurried changes. It was this kind of arrogance on the part of the new regime that would soon bring people into the streets in a way that nobody would have thought possible. The growing outrage was also prompted by the fact that the leader of the ruling party, Jaroslaw Kaczynski, having no official position except as party head, in effect individually directs an obedient President, Prime Minister, government, and the Law & Justice parliamentary majority without being held accountable. Jaroslaw Kaczynski is the twin brother of the late President Lech Kaczynski, who died in the tragic airplane crash in Smolensk, Russia, in 2010, that killed over 90 other ViPs as well. And Jaroslaw has been blaming the then ruling majority for the accident ever since. Meanwhile, on the web page of Studio Opinion, people were reading that suggestion of a Committee in Defense of Democracy, KOD, that would be aimed not at reversing the outcome of the elections, but at trying to put a dam in the way of the flood of actions by this new regime that was operating on the very borderlines of the law. It would be a forum through which people could express how horrified they were by the haste and radicalism of the changes introduced by the government, which were clearly destructive of the very rule of law itself. That “innocent” call for action expressed on Studio Opinion was picked up in late November by a previously unknown NGO activist, Mateusz Kijowski, who on November 18th launched a Facebook group called KOD – the Committee in Defense of Democracy. When KOD scheduled its first march for December 12th – to protest the new regime’s tampering with the Constitutional Tribunal – everybody (including the organizers!) was surprised that tens of thousands immediately showed up in Warsaw and in some other cities as well. And for the first time since 1989, problems of the Constitution and the Constitutional Tribunal were actually being discussed in the street. It was the same with the next demonstrations in over 40 Polish cities and in many places abroad with large Polish communities. The government reacted nervously, describing the protesters as disgruntled supporters of the centrist Civic Platform, which had lost the election, or diehard supporters of the Communists. Jaroslaw Kaczynski called the KOD marchers “Poles of the worst sort”. So, at subsequent demonstrations people came with buttons and placards saying, “I’m a Pole of the worst sort”. Interestingly, the multi-thousand marches and demonstrations often happened in places that were considered strongholds of Law & Justice. Most of those who came had retired from active participation in public life after 1989 as they felt they had done their bit. The government organized one counter-march by their own supporters and then went on the attack, declaring that the KOD protesters even included former members of the Communist nomenklatura and secret service. But at first glance, it was clear that the public, which dominated KOD demonstrations, included many recognizable faces of former Solidarity activists or activists of various more recent non-governmental organizations. And, of course, there were — as early surveys indicated — masses of ordinary people who in recent years had not been involved at all in public matters. When I arrived at the first KOD meeting in Wroclaw, the room, which could seat a few hundred, was already bursting at the seams. At least half of those people, as it turned out, had come from small towns and villages around Wroclaw. On the one hand, every mention of Law & Justice prompted boos. On the other hand, when someone stepped up and warned that we should not dismiss supporters of the ruling party in that way, because we have to live with them in the same country, he was applauded. When one older woman got up and told everyone that she had already written to Pope Francis asking him to support us, and that she had done it in Italian, a thirty-something in the back row shouted that even though he is an atheist he would like to sign that letter too. Among those, who spoke were teachers, freelance artists, a bus driver, a watchmaker, a homeless person, and a flower vendor. To counter the verbally aggressive discourse dominating rightwing demonstrations, like calls for hanging their adversaries from lampposts, KOD introduced a friendly, good-natured, humorous, at worst ironic, tone. When a journalist asked someone why he was marching with a dog, the answer was that his dog came along because he doesn’t like what Kaczynski’s cat is doing. [The Law & Justice leader’s fondness for his cat is well known.] A young man had come with a banner that read, “I got so upset that I had to bring a banner”. At the next demonstration the same man came with a larger banner that read, “This time I was so much more upset that I brought an even bigger banner”. A small girl sitting on the shoulders of her father had a tiny banner that read, “Please don’t do those things to people”. Thousands of people who had gathered in Wroclaw’s Salt Market, now more and more known as KOD Market, burst into song. To show they were aware that the government and Parliament had been making their decisions under cover of night, they sang the refrain from an old pop hit, something like “tattle-tittle-tattle-tittle-tattle at night, but blah-blah, blah-blah, and blah by day”. KOD’s mass activities have been organized by a middle generation shaped by employment within a modern, frequently western, corporate environment, whose style of management is sometimes met with a certain resistance by ordinary participants. As the majority of people in the demonstrations are over 50, it is for now primarily a revolution of 50-year-olds. It is not that there aren’t young people taking part (there is even a separate youth unit within the movement), but in an aging Polish society this is above all a movement of the Grey Panthers. And this is why leaders of the old Solidarity like Lech Walesa are continuously celebrated at KOD gatherings. It is, after all, a generation that has under its belt the experience of the multi-million-member democratic movement that was Solidarity and the remarkable political education this experience engendered. KOD has also brought together people with very diverse political views. A young enthusiast of the socialist thinker and revolutionary leader Rosa Luxembourg stands next to a woman who wants KOD to use as its anthem a song of the 18th-Century “Bar Confederation” that was comprised of aristocrats who wanted to rebuild the failing Polish state on a radically conservative basis. Today at KOD events, leaders of significant political parties are sometimes invited and uninvited. Mateusz Kijowski, the leader and the only person who speaks to the media on behalf of KOD, speaks of KOD as a programmatically non-party movement and even an apolitical one. At the same time, one of its elder participants, once a member of the anti-totalitarian opposition, Professor Aleksander Labuda, says publicly that calling the movement apolitical is like asking children to believe in fairy tales. Today KOD is about to make a serious turn. It seems that the growing participation in the demonstrations has arrived at its maximum potential. The very dedicated coordinators of the movement who do not live in Warsaw have temporarily put a brake on growth, as they are being authorized by the Warsaw committee to perform tasks that go beyond their social legitimation and often – because of the huge scale of the movement – their organizational abilities. In addition, there is an unsolved controversy as to whether at KOD’s demonstrations, dominated by national and European flags — the latter cursed by Law & Justice and removed from their governmental conference rooms — other flags should be appearing, such as LGBT or Ukrainian. For the time being, despite periodic invitations to the leaders of oppositional parties, the only flags that are considered unacceptable are those of the political parties. Perhaps more importantly, the movement has not absorbed new developments on the left, including those that identify themselves with the dissident tradition of the Solidarity period and are breaking the umbilical cord that has linked them to the post-Communist Alliance of the Democratic Left (SLD). Members of the small Green Party are welcomed if they do not appear under their own banners. However, the hit of the last elections, the “Together” Party (“Together” almost made it to Parliament even though it was only established just before the elections) is in conflict with KOD. Its well-educated thirty-something members openly say that they don’t want to treat the black plague of Law and Justice with the cholera of neo-liberalism. What they mean is that KOD appears to be close to the “Modern PL” party, which just got into Parliament and is led by a young economist, Ryszard Petru. On February 27 KOD organized a key event in Warsaw, a march under the motto “We, the people”, which was intended to deny the government and the Law & Justice majority any monopoly on the use of patriotism and national symbols. Unexpectedly the march became dominated by the need to defend Lech Walesa, who had long been attacked by the right — including groups even more extreme than Law & Justice — for an episode in his youth. As an intimidated young worker under pressure from secret service operatives, he allegedly signed an agreement to serve as an informant, but subsequently he refused to collaborate. On February 22nd the Walesa affair was brought up anew by a government agency, the Institute of National Remembrance, which announced to the press that it had recently uncovered new files that appeared to implicate Walesa as a collaborator. And so five days later people poured into the streets to protest. The Walesa affair diverted attention from important questions that KOD still has to ask: What next? KOD cannot survive by being just a powerless reviewer of the government. It has to find more constructive forms of activity. Meanwhile a petition with KOD’s program of changes in the Constitutional Tribunal was put into motion, and during a TV program, Mateusz Kijowski announced, with a somewhat cryptic smile, that KOD is currently constructing its own program for the coming months. But the biggest challenge facing the movement is the division between those quietly waiting for what Kijowski and his friends in Warsaw will come up with, and those who would like to take part in creating such a program. The latter are largely those who express themselves on KOD’s website, which has over 50,000 members. According to KOD and the city authorities, the recent demonstration in Warsaw on February 27, 2016, had at least 60,000 participants, while according to government and police estimates it was 15,000. However, the dispute over numbers is not the most important thing here. The “We the People” march brought back these words, well remembered in Poland, with which Lech Walesa began his address before the U.S. Congress in 1990. At one of the happenings organized by KOD, a six-hour event entitled “Essentials”, people were given packets of freshly baked bread straight from the bakery and copies of the Constitution freshly printed for the occasion and still having the aroma of ink; and they read aloud the Constitution, which — according to KOD — is broken every day by the government. Here again, the struggle is over definitions, and over meanings: What is a state of law? What is the Constitution for? Who is the nation? Who has sovereignty? And in this tug-of-war: just where is Poland? The popularity of Law & Justice goes up and down between 35% and 25%. According to the most recent surveys, KOD is supported by 43% of society. The leader of the movement, Mateusz Kijowski, says that KOD will never compete in elections, but is only there to guard democracy. At one of KOD’s demonstrations, I played on my little harmonica Beethoven’s Ode to Joy, the anthem of the European Union, and got a standing ovation. Of course, the people had been standing for some time already, determined to preserve the values symbolized by those familiar notes that our new regime would like to erase from the musical staff. 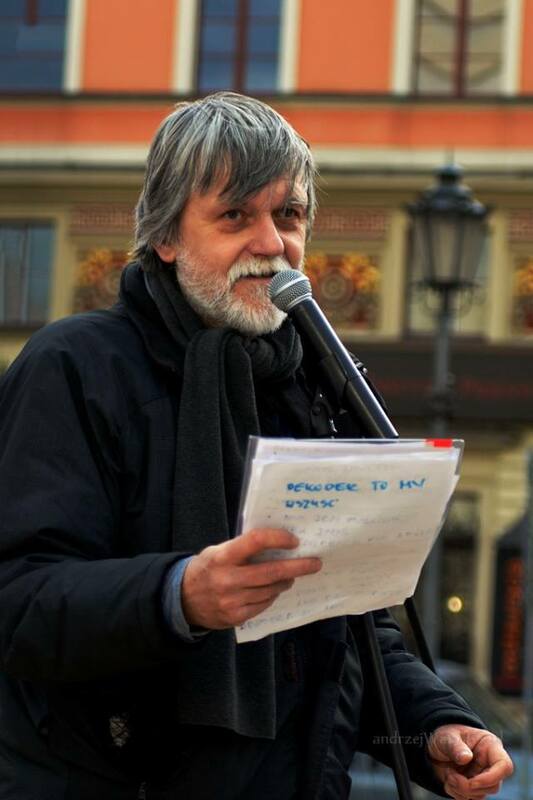 Leszek Budrewicz – 60, journalist, poet, novelist, and lecturer at the Lower Silesia University in Wroclaw; former activist with Solidarity and the oppositional peace movement Freedom & Peace; and somewhat earlier a member of Poland’s national water polo team. Leszek Budrewicz speaking at KOD rally. ← TCDS Open House Featuring Brazilian Journalist Leonardo Sakamoto!